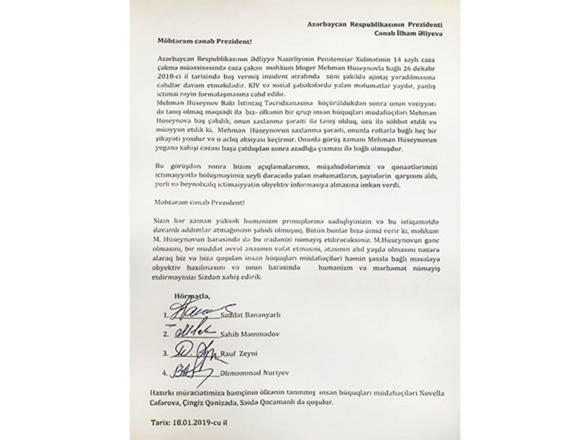 A group of human rights defenders in Azerbaijan, namely, Saadat Benenyarli, Sahib Mammadov, Rauf Zeyni, Alimammad Nuriyev, sent an appeal to Azerbaijani President Ilham Aliyev in connection with Mehman Huseynov’s case, Trend reports on Jan. 21. According to the appeal, the attempts are being made to artificially create fuss around the incident that occurred on December 16, 2018 in connection with Azerbaijani blogger Mehman Huseynov, who is imprisoned in the penal institution #14 of the Penitentiary Service of the Ministry of Justice. "False information is disseminated in the media and social networks,” the appeal said. “The attempts are being made to create a false public opinion. We, a group of human rights defenders in Azerbaijan, visited Mehman Huseynov, review the condition of his detention and talked to him. He has no complaints about the conditions of detention and he does not go on a hunger strike." During the meeting, Huseynov’s request was to be released after the completion of the sentence. 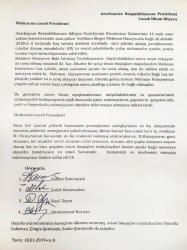 Human rights defenders Novella Jafarova, Chingiz Ganizade, Saida Gojamanli also joined the appeal.